From the sea, the most visible structures in Naples are the museum of San Martino and the fortress of Sant' Elmo, located on the Vomero hill at the highest point in the city. The museum used to be a monastery that was finished and inaugurated under the rule of Queen Giovanna I in 1368. It was dedicated to St. Martin, bishop of Tours. During the first half of the sixteenth century, propelled by the energies of the Counter-Reformation, it was expanded. Later, in 1623, it was further expanded and became, under the direction of architect Cosimo Fanzago, the quintessentially Baroque structure one sees today. Fanzago was responsible also for the small cemetery in the courtyard; a cemetery ornamented by rows of skulls, a typical Counter-Reformation memento mori—a reminder of mortality. Under the French, the monastery was closed in 1806 and was abandoned by the religious order. Today, the museum houses a museum with a fine display of Spanish and Bourbon era artifacts, as well as a recently restored presepe, or Nativity scene, a display made up of thousands of finely wrought eighteenth-century Christmas figures. It is the finest display of its kind in the world. (Click here for more about the presepe.) The green area directly below the white San Martino museum is now separate (originally it was the vineyard for the monastery). It is called the Vineyard of San Martino and is a working garden/farm in the middle of the city(! ), hosting tours for all and summer activities, especially for children. Although there was a Norman watch tower from the 1100s on the hill, a true fortress was not started until 1329 under Robert of Anjou; it was completed in 1343, the year of his death. 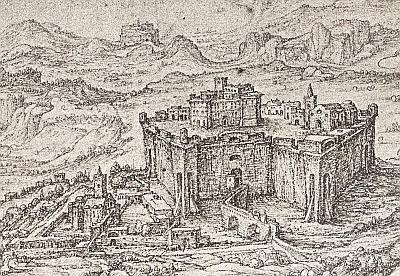 That fortress was known as Belforte (image, left). The strategic importance of the fortress was clear, and Spanish viceroy, Don Pedro de Toledo, had it rebuilt between 1537 and 1546. 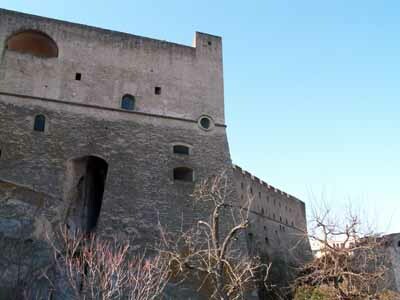 The new fortress was on the same site, and though it is a massive remake, especially the radical design (image, below), it left intact some of the original Belforte structure (the small village-like assemblage of buildings on top of the new fortress, as seen in this 1582 image of the now Sant'Elmo castle,). The result was a spectacular star-shaped castle with 12 cannons; part of the six ramparts with "double-claw" design rest against the rocky tuff of the hillside so that the castle blends in with the surrounding environment. The fortress was partially destroyed in 1587 when a lightning strike caused the ammunition dump to explode, killing 150 men in the process. During the revolution of 1647, so-called “Masaniello’s Revolt,” the Spanish viceroy took refuge in the fortress to escape the revolutionaries. The people stormed the fortress but failed to take it. Sant’Elmo was also a dramatic symbol of the short, turbulent period of the Neapolitan Republic (alias Parthenopean Republic), the local version of the French Republic. The fortress was taken by the populace in 1799 and the Republic was proclaimed. A few months later, the revolutionaries were forced to capitulate to Royalist forces under Cardinal Ruffo. For a short period, Sant’Elmo had been a bastion of freedom against Bourbon absolutism; now it proved to be the prison and place of execution for a number of the Republic’s supporters. The fortress has been restored to public use since 1980 and houses the "Bruno Molajoli" Art History museum.